As the months pass and the excitement builds for the release of the all new Ford GT, I take a look back at what made the original a favourite for young boys bedroom walls and an iconic piece of global motoring. In 1963, a deal between Henry Ford II and Enzo Ferrari to combine assists of each others self named motor companies had fallen through, angering Ford, and giving him the desire to build a machine that would beat the Ferraris on the global race circuit. Ford had proposals from three manufactors to provide support to their projects, and selection Lola; a company who had used a Ford V8 engine previously in one of their own Le Mans racers. Aided by Eric Broadley, John Wyer and Roy Lunn, who were all highly respected automotive names, formed Ford Advanced Vehicles Ltd, began work on the GT40 and then moved to Slough. 1st April 1963 saw the birth of the legend, the first Ford GT was unveiled with a price tag of £5,200. The 40 in the car’s name is a nickname which is related to its height. Le Mans 1966 remains the closest finish in the race’s finish. 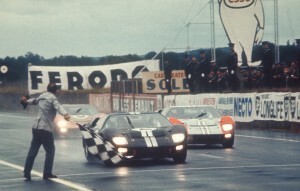 Bruce McLaren and Chris Amon won the race by 8 metres. The GT40 first hit the race track in May 1964, retired from the Nurburgring 1000km race with suspension failure. After a disastrous Le Mans 24hr race, which saw none of the three cars finish the race, John Wyer was removed from his responsibilities and the team was handed over to Carroll Shelby; a man who has become world famous with his links to the Mustang. Shelby’s involvement led to immediate success, with wins all through 1965 and continuing into 1966, until the GT40 hit it prime at Le Mans. A 1, 2, 3 finish for the team in France led the motoring world in pandemonium. The vehicle won the Le Mans event again 1967, 68 and 69, to cement it’s place in history. 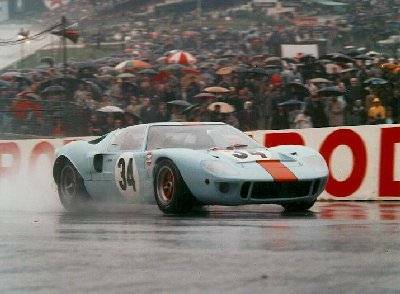 In total 133 GT40s were made, the most desirably sporting the iconic Gulf Racing Livery. Steve McQueen’s race car sold in 2012, donning the livery for $11 million. 2004 saw the release of a new GT, this one being slightly taller and wider than the originally, but looking very similar to the original. To conclude, the Ford GT40 will forever be remembered as one of the greatest race cars ever built, and those who saw it race will have fond memories to last a lifetime.